If it involves combating digital crime -- whether it's analyzing major cases, assisting local, state and federal investigations, or training current and future cyber forensics professionals -- it's a good bet Marcus Rogers is involved. Rogers is professor of computer and information technology, associate department head, faculty lead for Purdue's cyber forensics graduate program and a University Faculty Scholar. 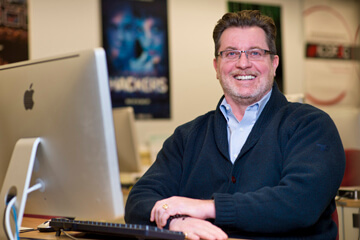 In addition to being a deputized investigator for the Tippecanoe County Sheriff's Department, Rogers is a go-to media expert on cyber forensics and an award-winning researcher. What are some details about Purdue's cyber forensics graduate program? I helped build the program when I joined Purdue's faculty in 2004, after I spent a year conducting cyber forensics research at Purdue's Center for Education and Research in Information Assurance and Security (CERIAS). Right now, the program has 43 graduate students and one other faculty member. Each semester, we also have one or two visiting faculty members from across the world, including China, South Korea, Germany, Turkey and India. All of our graduate classes take place in our Cyber Forensics Laboratory, which is equipped with the tools needed to gather digital evidence that would stand up in a court of law. We train our students to always meet that standard when gathering evidence because many of them will go on to careers as investigators for law-enforcement and intelligence agencies. Once our students have enough training, they provide operational assistance for local law enforcement. Our students assist with almost every kind of case, because almost every case involves some kind of digital evidence. For example, drugs cases almost always involve cellphones. Money laundering usually involves a digital footprint, and so on. The only cases our students don't handle are ones that involve offenses against children, because federal law dictates that only sworn officers can work on those cases. That's why I'm a sworn officer for Tippecanoe County -- because I assist them with those kinds of cases. Do the program's students participate in internships? Yes, our students all complete an internship that's worth three credit hours. In fact, while their coursework involves learning about and assisting with criminal as well as civil cases, we try to match students with internships that align with their interests. Some students might intern for corporations or law firms that handle civil cases, if they want to pursue that kind of work after graduating. Others might intern with public agencies that handle criminal cases. Our alumni have gone on to some very illustrious careers. About half work in academia as faculty members or administrators, and about half work for national labs or law enforcement and intelligence agencies. Our program doesn't just train students -- we also train current industry professionals, including investigators at all levels. Our program has a top-notch reputation -- for every student we admit, we have 10 applicants vying for that spot. A lot of students domestically and internationally apply because we've been involved in the academics of cyber forensics for longer than just about anyone else. We also have a 100 percent graduate placement rate. In fact, most of our students receive job offers before they've finished their first year. What kind of research do you conduct outside of your teaching duties? I focus a lot on predictive modeling, which tries to pinpoint things such as future terrorism targets. For example, one of my projects involved putting together profiles of criminals based on several years of their Web browsing history. In 2013, that project won the Outstanding Research Award in the American Academy of Forensic Sciences' Digital and Multimedia Sciences section. In 2014, another of my projects won that organization's Case Study Award. That project discovered a piece of malware that can commit a crime -- such as hijacking bank accounts -- while a person is using his or her computer. Once the malware has committed the crime, it can then erase itself without the person ever knowing the computer was infected. How did you become interested in cyber forensics? For me, cyber forensics was the perfect marriage of technology and law enforcement. My background is as a forensic psychologist, but I was also building computers at home when I was a kid in Canada. I've always been fascinated with how and why people use technology to commit crimes. Now, I get to use my knowledge and skills to work on cases and to train the next generation of cyber forensics professionals. For me, it's a great situation.